The bill is for 1 bag with a whig rose design. It asks that the bill be returned with remittance. 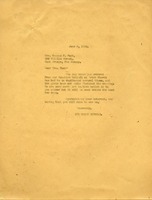 Letter to Ellen Koch from The Berry Schools. 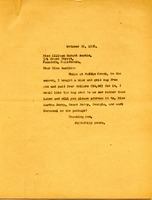 The Berry Schools write to Miss Koch about a bag and scarf that she had returned, letting her know that it couldn't be done exactly the same way when repaired. They let her know that it could be refunded or possibly redone with a different scarf that will look like the bag if she would like. Helen M. Haven sends a $2.75 check for a bag she had ordered and received.